Climate change–ravaged? Trust the BBC to make it sound melodramatic. A state government report said it was almost certainly caused by "ocean inundation of the low-lying cay, very likely on multiple occasions, during the last decade, causing dramatic habitat loss and perhaps also direct mortality of individuals". In fact, the demise of the little rat is far from as straightforward as the BBC would like you to believe. The Bramble Cay Melomys (Melomys rubicola) has one of the most unusual and precarious distributions of all Australian mammals. The melomys is restricted to an unstable 4-5 hectare coral cay in the eastern Torres Strait, off the tip of northern Australia…. There’s really not much room on Bramble Cay, not even for a mouse. There are accounts of visits to Bramble Cay in the mid 1800s that describe the Bramble Cay Melomys as abundant. In 1998, 42 individuals were captured in live traps over six nights. The population was estimated to be around 98 individuals. Repeat surveys in 2002 and 2004 recorded 10 and 12 individuals respectively, and annual visits to the cay by turtle researchers since 2007 have failed to detect any presence of the species at all. The small, apparently declining population and limited distribution place the Bramble Cay Melomys at high risk of extinction. Bramble Cay also serves as a rookery to marine turtles and seabirds. The vegetation is disturbed by nesting seabirds throughout the year and by turtles between October and March. In our December 2011 survey the area disturbed by turtles was quite extensive, and many turtles were nesting towards the centre of the cay. Photos show a substantial reduction in the cover of vegetation between 2009 and 2011. Bramble Cay is only ten feet high, and consequently is naturally vulnerable to storm surges and king tides. However a rise of 3 inches since the 1970s is hardly likely to have made the slightest difference to the rat’s survival. Furthermore, longer term records from Sydney indicate that sea level rise peaked in the 1950s, which questions how much of the rise during the 20thC was natural, rather than man-made. The simple fact is that such a small population in such a small and unstable habitat is always at risk of extinction for a variety of reasons. In this instance, it seems pretty clear that the major factor was the loss of vegetation attributable to the activities of turtles and seabirds. But that does not make very good headlines, does it? ← Fight Climate Change? That’s for You Plebs! The BBC’s dire flaw of jumping to a conclusion based on prejudice, confirmation bias, is based on dishonesty as much as ignorance: that is not what the BBC are paid for, as John Reith knew. A deliberate plan is not a flaw. About 15 feet above sea in 1821 and about 40 feet now… after 198 years. Thanks to climate change? The Britannica cays reference makes it sounds like the height is function of accretion/erosion processes and therefore small steady sea level rise is of no significance. It says even large cays are at risk of being completely eradicated by storms, they always have been and always will be. Scientists like declaring new species, to boost their career, and also so that they can immediately declare them vulnerable and then extinct – in reality they are just sub populations. These inbred rats probably have close relatives from whence they arrived. It’s 50/50 if they arrived on floating debris or a boat – so man may be the only reason they were there in the first place. The green turtle activities are an obvious issue, as are many of the bird species listed as nesting there – several papers mentioned that the rats avoided bird nesting areas, and certainly some of the larger species, even though predominantly fish feeders, would not turn their nose up at a handy rat snack. A google search for melomys had a pretty good echo for first mammal extinction. I did find through the Sydney Morning Herald this paper saying extinctions are running 100-1000 times above normal background level. It discusses 3 extinctions. Really scary that they can get 1000 x normal rate and only talk about 3. So for 30 years the sea level around the cay seems to have risen but from 1987 – 2011, it had actually shrunk again? Surely not due to man-made climate change??? Isn’t AGW supposed to work the opposite way? Is this another BBC statistic they let fall between the cracks, like that of the IPPR the other day? Or have I maybe missed something? One big storm cold have carried them all away! The claim this rodent is “climate-change ravaged” is surely the most absurd headline in 2019. “Farmers and cattle herders have clashed over land for as long as most people can remember in Kaduna. But they’re coming into increased proximity due to climate change. Seems to make the case that the root cause here (for whatever it is) is population growth; certainly not GW, nor CC. They simply made it up – and then shrilled about it in the headline. But perhaps a 1/2 million readers read the headline, walking away thinking perhaps AOC is our only hope. ‘Scientists’ tripped almost 1/2 of the entire population. What effect does that have on the poor little critters? “A state government report said it was almost certainly caused by “ocean INUNDATION of the low-lying cay, very likely on multiple occasions, during the last decade, causing dramatic habitat loss and perhaps also direct mortality of individuals”. Ocean inundations are not the same as sea level rise. The threat of them takes place all the time. Semantics? They say storms/surges have increased because of climate change. It’s patent nonsense, in such a location they were doomed from the moment they swam ashore. Global warming killed my rat – LOL. Half a degree extra in a hot country was too much for it? You can’t make this garbage up. They do make it up. This was also thrashed out on euanmeans some years ago. The islet is 50 km. from PNG and right about where floods down the Fly river would deliver vegetation, sand/mud and any light animals. The “scientists” have checked the DNA of rats on Australia 200km. away but apparently NEVER checked what variety and numbers were in PNG. Funny that. They found an ‘extinct’ bee last week. I reckon they are just hiding. I can’t remember where I read it, but I think something like 2/3 of all animals declared extinct are subsequently rediscovered and the average time it takes is 60 years. I think those horrible Birds & Turtles have eaten them all, especially the young ones. Any idea what the tower is in that picture? Is it possible that it is potentially the source of an element not in the normal diet that might affect the reproductive capabilities, or that in the process of building that tower, they inadvertently left behind something that would affect a small, potentially stable, population through poisoning? I find the tower, or the construction of it, the far more likely reason that this variant of a mouse went extinct. 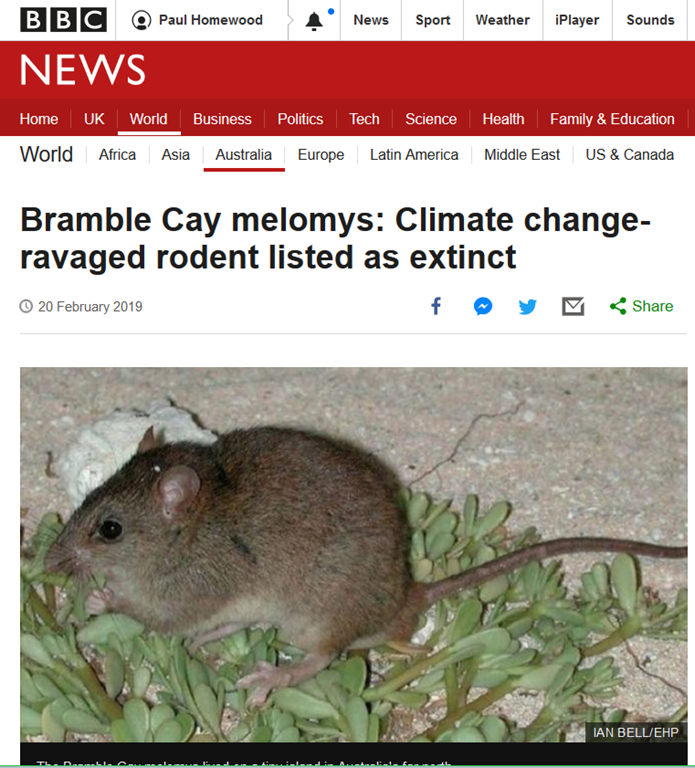 “Climate change-ravaged rodent listed as extinct” Is it possible for the BBC get any more emotion and any less factual and scientific information into this? The BBC article was clearly deliberately long on emotion and very short on facts. They omitted to mention several important stresses on the population especially the amount of inbreeding which had been recorded as a factor enfeebleing the population. Strange that the BBC “missed “that together with “missing” the fact that the island is only 3m above high water at it’s highest point….strange that for a media outlet which has a charter which promises so much integrity, unless……………….